Standing at 2,717 feet (828m), the Burj Khalifa in Dubai, UAE is the tallest building in the world (and casts quite a long shadow!). The design of the 163-floor structure is an abstraction of the Hymenocallis, a type of desert flower that has long petals extending from its center. The building has been very well received since it opened in 2010; however, its construction was very controversial as it was built primarily by workers from South Asia and East Asia who earned low wages and were housed in abysmal conditions. Thank you! Get ready to change the way you see our planet. Madagascar is one of the most heavily deforested countries in the world, which has contributed to erosional gullies known as “lavaka." These scar-like formations start as a fissure or crack in the soil, and widen into massive craters that reveal the island's famous red soils. In this photograph by @alizecarrere, freshly formed lavaka pock-mark the Malagasy Highlands north of Antananarivo. In an interesting twist to the story, local farmers have noticed that these spots eventually turn into fertile pockets where nutrient-rich top soil and water collect, making them a prime environment to grow trees and crops. Agricultural development in Stavrapol Krai, Russia is made possible with water that travels down from the Caucasus Mountains. The region’s temperate climate supports grape and grain crops. 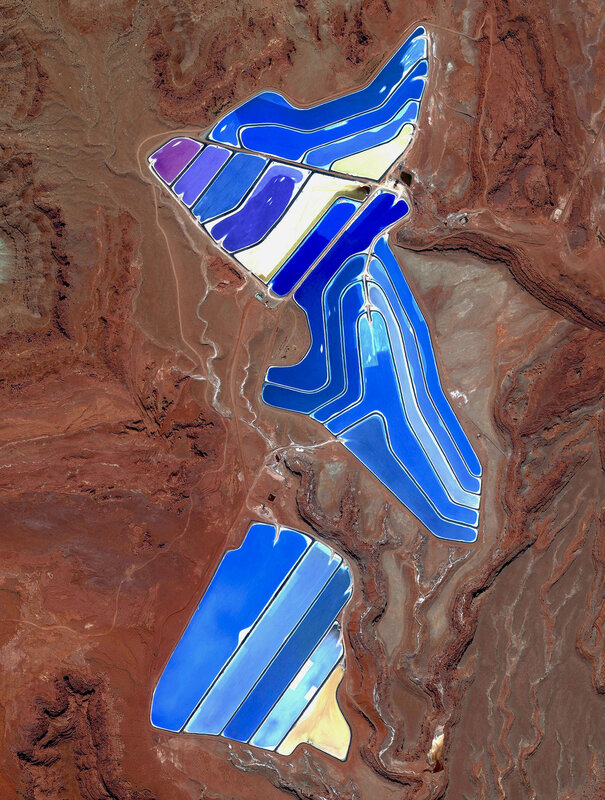 Evaporation ponds are visible at the potash mine in Moab, Utah, USA. The mine produces muriate of potash, a potassium-containing salt that is a major component in fertilizers. The salt is pumped to the surface from underground brines and dried in massive solar ponds that vibrantly extend across the landscape. As the water evaporates over the course of 300 days, the salts crystallize out. The blue color seen here occurs because the water is dyed a deep blue, as darker water absorbs more sunlight and heat, thereby reducing the amount of time it takes for the water to evaporate and the potash to crystallize. This image was also just featured in a fantastic interview by Perrie Hartz at Indigare Magazine. You can check it out here. 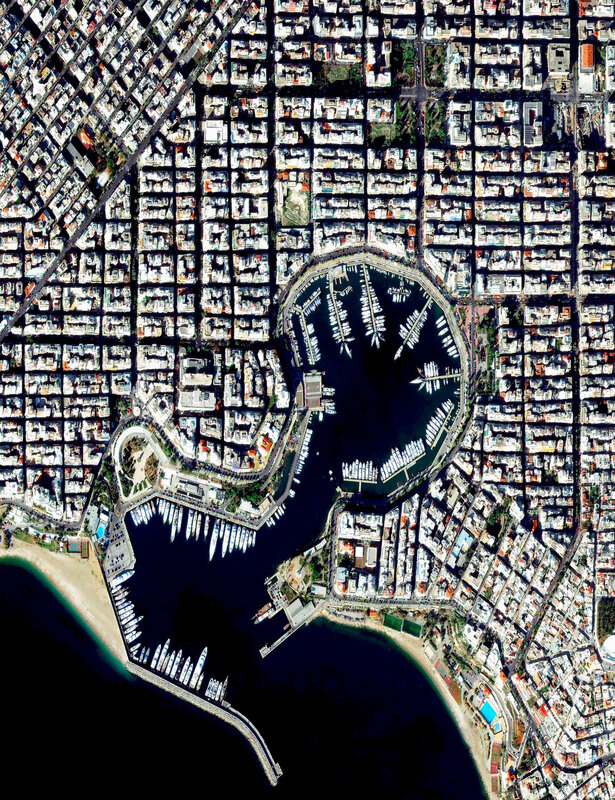 The Piraeus Marina is located on the Bay of Zea and is surrounding by gridded streets in the Greek city of Piraeus. The city was developed in the early 5th century BC, when it was selected to serve as the port destination of classical Athens. Now, the city contains the second largest passenger port in the world, which services about 20 million passengers every year. Moscow is the capital and largest city in Russia with 12.2 million residents. The city is organized into five concentric transportation rings that surround the Kremlin. The two innermost rings are seen here. A newly formed crack in the Larsen Ice Shelf in Antarctica extends as far as the eye can see. The fracture is currently measured at 100 feet wide and over 100 miles long, growing more than 50 miles alone since 2011. If this chunk of ice breaks away, roughly 2,000 square miles will be lost - that’s roughly the size of the state of Delaware. The break is the latest example of major ice loss in the fast warming Antarctic Peninsula and could lead to a rise in global sea levels by roughly four inches (10 centimeters). Before you even ask, this is indeed a real image of Earth! In August 2015 a massive bloom of cyanobacteria - more than 100 square kilometers - was seen in the Baltic Sea. Cyanobacteria are a type of marine bacteria that capture and store solar energy through photosynthesis. While some are toxic to humans and animals, large blooms can cause an oxygen-depleted dead zone where other organisms cannot survive. Scientists believe that blooms are more likely to form in the presence agricultural and industrial run-off or from cruise ships that provide excessive nutrients for the bacteria through the dumping of sewage. Continuing with our favorite Overviews of 2016, here is one from October of Niagara Falls — the collective name for three waterfalls that straddle the border between Ontario, Canada and the United States. Horseshoe Falls is seen here. The falls have the highest flow rate of any waterfall in the world, with a vertical drop of more than 165 feet (50 m). The Maid of the Mist, also visible here, is a boat that has carried passengers into the rapids below the falls since 1846. Today is expected to the busiest travel day of the year in advance of this weekend’s holidays. In the United States alone, more than 103 million people are expected to be travel more than 50 miles this week. Chicago O’Hare International Airport, seen in this Overview, is the fourth-busiest airport in the world and is expected to handle the majority of the ~ 4.5 million people flying to and from Chicago, Illinois this weekend. Whether you are in the air, on the road, or safe at home, I hope you all have a joyous and wonderful holiday! Vineyards surround the Moselle River in the Trier-Saarburg district of Germany. The region is recognized for its production of Riesling wines with 9,000 hectares of land (roughly the size of Manhattan) dedicated to grape growing. I’m heading home from Florida today and excited that I’ll have the window seat. Because many cities in the state contain master-planned communities, often built on top of waterways in the latter half of the twentieth century, there are a number of intricate designs that are visible from the Overview perspective. Here is one particular development in Cape Coral, a city with a population of 165,831 people. The canals of Amsterdam are a result of conscious urban planning. In the early seventeenth century, when immigration was at a peak, a comprehensive plan for the city’s expansion was developed with four concentric half-circles of canals emerging at the main waterfront (seen at the left in this Overview). In the centuries since, the canals have been used for defense, water management, and transport. They remain a hallmark of the city to this day. Here’s a never-before-seen image from “Overview.” Hutt Lagoon is a massive lake in Western Australia that gets its pink color from a particular type of algae - Dunaliella salina - that grows in the water. The lagoon contains the world’s largest microalgae production plant, where the algae is farmed for its beta-carotene, which is then used as a food‑coloring agent and source of Vitamin A in other products. Shipping containers are loaded into a massive cargo ship (1200+ feet) at the Port of Long Beach — the second-busiest container port in the United States. The seaport generates approximately $100 billion in trade, employs more than 316,000 people, and along with the Port of Los Angeles to which it is connected, serves as the single largest source of air pollution in the metropolitan LA area. Hundreds of dwellings - all painted in a vibrant red color - make up Larung Gar, the world’s largest Buddhist institute. The settlement is located in a remote valley in Tibet and contains a population that has grown to approximately 20,000 people since its founding in 1980. In recent years, the Chinese government has started to systemically demolish homes and force thousands of occupants out of Larung Gar, claiming the settlement is too crowded and unsafe. They have also closed off the area to all foreigners. Many Tibetans fear the erosion of their language, traditions, and ways of worship in the midst of these incursions by the Chinese government. Today marks my 1000th post on Instagram! I started this project because I believed the Overview perspective not only offered a means to look at our planet like never before, but also was something that could bring people together. To see where the project is now, nearly three years and 1000 posts later, has exceeded all of my wildest expectations. A sincere thank you from the bottom of my heart to everyone who has shared the images, purchased a copy of “Overview", or simply followed along. Here’s to the next thousand posts! Hundreds of residential homes are seen in the southwestern suburbs of Las Vegas, Nevada, USA. The city’s metro area is home to roughly two million people. Here’s one of my favorite images from "Overview” - Venice, Italy. The city is situated upon 118 small islands that are separated by canals and linked by bridges. With its tide waters expected to rise to perilous levels, the city has constructed 78 giant steel gates across the three inlets, through which water from the Adriatic could surge into Venice’s lagoon. The panels – which weigh 300 tonnes and are 92 feet (28 meters) wide and 65 feet (20 meters) high – are fixed to massive concrete bases dug into the seabed. Beijing Capital International Airport is the second busiest airport in the world, handling more than 90 million passengers every year. The dragon-like layout of the terminals is meant to celebrate the thrill and poetry of flight, while the orange roof evokes the vibrant coloration of the city’s famed Forbidden City. Here’s one of the most stunning images from the Where We Power chapter of “Overview”. Automated cranes move on tracks at the Qinhuangdao Port coal terminal, the largest coal shipping facility in China. From here, approximately 210 million metric tons of coal are transported every year to power plants in the major cities of southern China. That yearly tonnage is roughly equal to the mass of 3.6 billion people. To see more images from the book and to learn more, click here. The White House is the official residence and workplace of the President of the United States. Located at 1600 Pennsylvania Avenue in Washington, D.C, the building has served as the home of every U.S. president since John Adams (1800). If you’re a United States citizen, make sure you get out and exercise your right to vote today! Our new book “Overview” contains 70 images that have never been posted on our feed before! Here’s one that captures the natural beauty of Mount Fuji — an active stratovolcano and the tallest peak in Japan, rising 3,776 meters (12,389 feet). As seen in this Overview, Fuji has an extremely symmetrical cone, which is snow‑capped several months of the year. During warmer months, climbing routes make it possible for hundreds of thousands of people to scale the volcano each year. Last night the Chicago Cubs won the World Series, ending a 108-year streak since the franchise won its last championship. Congratulations to all of the Cubs fans in Chicago and all around the world! The team’s home stadium, Wrigley Field, is captured in this Overview. The haunted house at the Eastern State Penitentiary in Philadelphia, Pennsylvania is consistently ranked among the scariest Halloween attractions in the United States. The prison operated from 1829 until 1971 and housed notorious criminals like the gangster Al Capone. The facility was also the first of its kind to be constructed in a “wagon-wheel” layout with seven wings of cellblocks radiating from a central hub. Hope everyone has a safe and scary Halloween!